Your horse’s spine is designed like a bridge. The vertebrae are strung together and supported by muscles, similar to the design of a suspension bridge. When the additional weight of a rider is added, the spine is supported by the back muscles and the abdominal muscles. If these are weak, the danger increases of the vertebrae sagging and leading to further problems. When we speak of building topline in horses, we are speaking of developing all of these muscles. 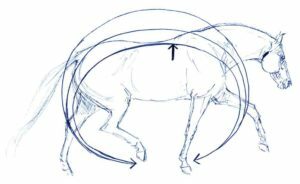 Topline in horses actually consists of all the muscles along the neck, withers, back, loin and hindquarters of the horse (gluteal, dorsal and cervical extensor muscles). The topline should be rounded and strong, not sunken in in any way. When your horse moves, he should appear relaxed and be able to coil his loin muscles, raise the base of his neck and move freely and powerfully forward. Strengthening the topline will make this easier for him and healthier for the spine. What does a weak back look like? A horse with a weak back will probably not ‘track up’ as much as he should. The hind foot should step, at the very least, into the footprint left by the front foot. Seen from behind, a weak backed horse will often walk with its left and right hooves too close together, as if walking on a tightrope. He might also tend to ‘pace’, where the two left legs move forward together, followed by the two right legs. A good walk has a rhythmic 1-2-3-4 beat. He will also, because of all the above, lack impulsion and straightness. After ruling out disease as a possible cause of lack of topline in horses, it really comes down to two ways to improve it – diet or exercise. With this plan, we address both of these. In order to make build topline in horses quickly and effectively, you might need to make a few lifestyle changes. A horse standing in a stable has an idle topline. It is far better if he can be turned out, at least for a few hours every day. Walking around, grazing, playing with his friends will all be beneficial. If you can, stop using haynets or elevated hay racks. Horses should be eating their hay at ground level. Make sure that you, the rider, are fit and balanced. If you are uneven in your seat or flopping around in the saddle, your horse won’t be able to use his back well. Ensure that your saddle fits correctly. A poorly fitting saddle can cause huge problems. Make sure that your horse’s feet are healthy, strong and in good condition. Moving cautiously because of foot pain can cause loss of muscle tone in the back. Then, in addition to the total amount of protein, you need to think about protein quality as well. A big problem arises when a specific amino acid is required and is not available. Essential amino acids are amino acids which cannot be synthesised by the horses body and therefore HAVE to be present in his diet. If the amino acid required by the RNA is not present during protein synthesis, the entire process stops. Which means that that muscle doesn’t get developed. The most ‘limiting’ amino acids are Lysine, Methionine and Threonine. This means they are the amino acids which most often shut down protein synthesis because they are absent. So it makes sense to add a supplement which contains all of the essential amino acids, especially the limiting ones. For the purposes of this programme to build topline in horses, we will assume that the horse in question has been in light work for a few weeks at least and that the rider now wants to get him show ready, fit and (of course) develop his topline. Adjust this programme to suit yourself and your horse, it is simply a guide. Start off by hacking out at a walk on a long rein for about an hour a day. Allow the horse to completely relax, mentally and physically. Encourage him to lower his head and stretch his neck. (This stretches all the muscles along the back.) Walk up and down hills. Don’t slop along – walk forward with a loose swinging stride. Start to introduce trotting in the same loose, free forward way on a long rein. Don’t worry if his head is at knee level, that is where you want it. Do quite a bit of trotting on a long rein up hills. Again, the horse must engage and move forward with energy and purpose. In week 3, introduce canter work, on a long rein out on hacks. Keep it slow and loose and include quite a few hills. If there is safe knee-deep water along your hack, trot through it. Trotting through water causes the horse to lift his belly using his back muscles. You can now introduce work in the school. Keep the long rein, encourage your horse to stretch his neck down. Do large circles, big loops, changes of direction. After warming up long and low, start to pick the reins up and ask for more collection. Do transitions between walk, trot and canter and also within the gait – slow, medium, fast. Ask for short extensions. Use half-halts to encourage self-carriage. Do some easy lateral work where you encourage the horse to step under with the hind legs, engaging the topline muscles. Keep a couple of days a week for hacking as per the previous few weeks. A small circle around a cone with a long rein and a lot of inside bend. Leg yield on a long rein with a low head and a lot of inside bend. Turn on the forehand. When the horse easily drops the inside rein to you and willingly gives the outside rein a contact, the correction has been made. Turn on the haunches from a standstill, bending to the inside with an open rein. A core score 0 horse (a horse with very low danger of spinal problems) will walk, trot and canter in balance with his nose very near the sand the moment you fully give the reins. This is your goal.